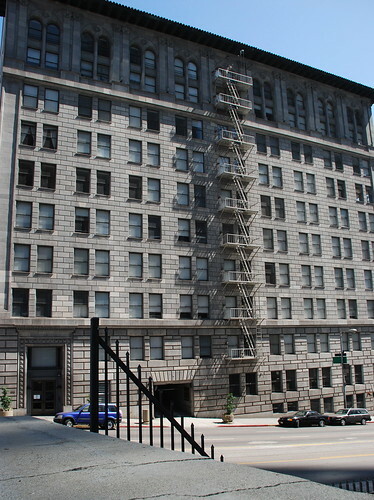 In 1913, Hearst commissioned Julia Morgan – who’d go on to create his San Simeon castle – to design new headquarters for the paper at Broadway and 11th. 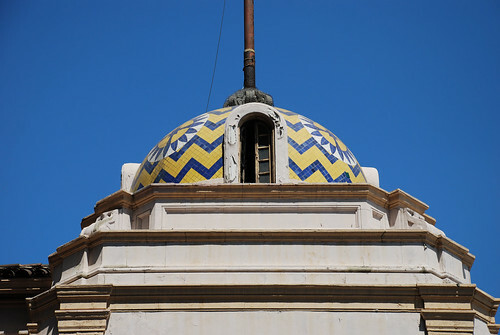 Working with Haenke and Dodd, Morgan came up with this 100,000 square-foot Mission Revival building featuring a hand-painted tiled lobby of gold and marble and a private apartment for the Chief upstairs. The black & white pictures are from the Los Angeles Public Library Photo Collection. 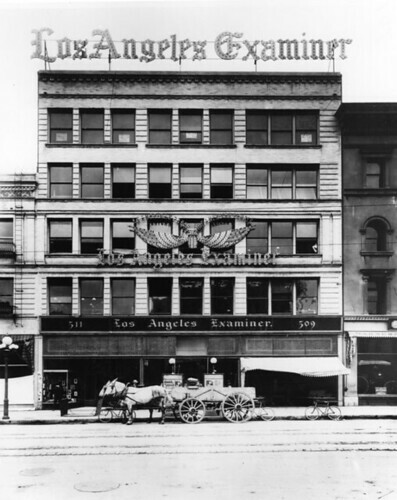 In 1922, eight years after the Examiner’s new office opened, WRH increased his journalistic empire by acquiring the Los Angeles Herald, first printed on October 3, 1873, by Charles Albert Storke in “a single-story brick block on Spring Street, nearly opposite the old Court House.” Then, in 1931, Hearst bought the Los Angeles Evening Express, founded in 1871 by five men calling themselves Tiffany and Co. (Tiffany was George A. Tiffany). Hearst put together the two papers as the Los Angeles Evening Herald-Express. This paper operated out of a building near Pico and Trenton Streets (torn down in the 1960s to help make room for the Convention Center). Confused? I sure am. In 1962, the Hearst Corp. (the Chief died in 1951) merged the Examiner with its evening Herald-Express. The company then made the poor decision to focus on its afternoon circulation. Shortly after, the Los Angeles Times closed its afternoon paper, the Mirror, and began to corral the city’s morning trade. In addition, advertisers were beginning to shy away from the afternoon Herald Examiner due to its higher percentage of blue-collar readers. Plus, evening newscasts were grabbing more and more of the public’s attention, rendering afternoon rags more and more obsolete. Oh. And there was that decade-long Newspaper Guild strike which hit the Herald Examiner in 1967, too. That had to hurt. Daily circulation that year was at its peak at 729,000. It was then the country’s largest afternoon daily newspaper, but it was all downhill from here. In July 1989, the Hearst Corporation announced it was putting Her-Ex up for sale (although the paper had been looking for a buyer for a while with no luck). By this time, the paper was ranked just the 42nd largest in the nation, with a daily circulation of 238,392 daily and a Sunday run of 183,122 (comparatively, the L.A. Times had a circulation of 1,118,649, nearly five-fold the amount). Despite a last-ditch effort for a management-led buyout of the paper and some interest from Marvin Davis and the Toronto Sun, Herald Newspapers vice president Robert J. Danzig announced on November 1 the paper was shutting down. 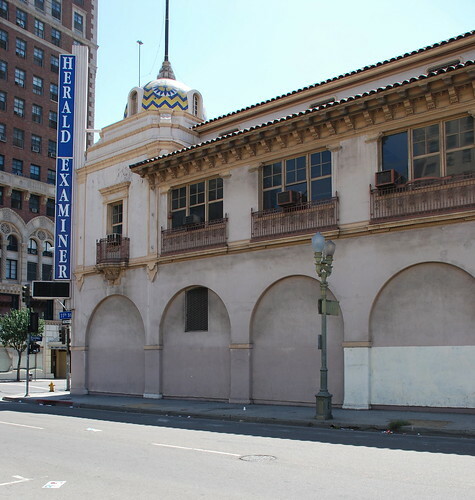 The Herald Examiner published its last edition the very next day. That final paper, with the headline “SO LONG, L.A.!”, was the Herald Examiner’s fourth-largest seller ever, moving nearly 400,000 copies. Maybe they should’ve published their final paper every day. 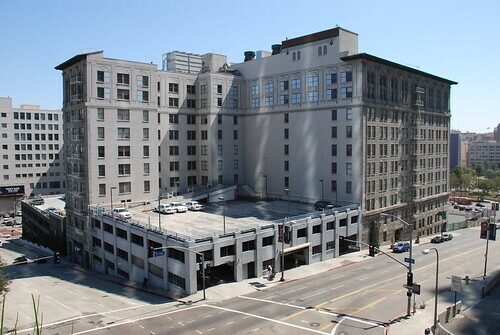 The site of the 1949 Press Building. What’s up with the building now? You got me. 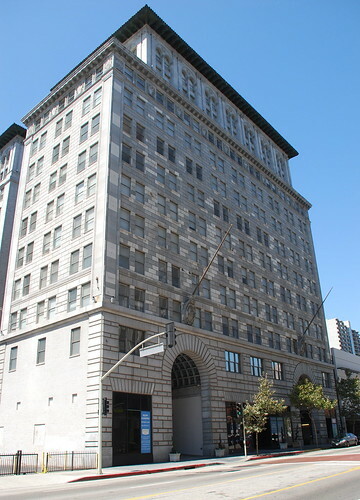 Developers Urban Partners were chosen in 2002 to convert the landmark into offices. 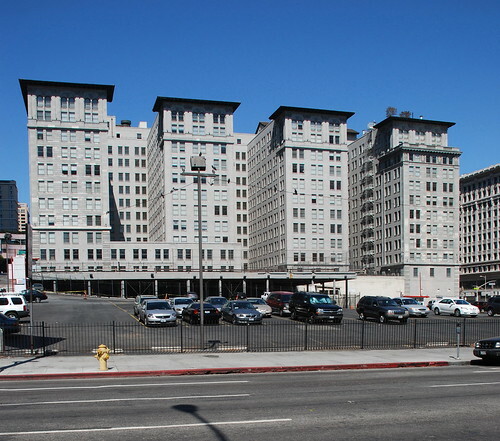 Three years later, they were turning the old Herald Examiner building into a 600-unit residential and retail complex. As of last November, the Hearst Corporation had dumped Urban Partners, but on board the $350 million project was restoration-architect Brenda Levin (let’s hope the plans call for the replacement of the building’s big arched windows, filled in for more than sixty years). Also contributing to the project is Thom Mayne, whose two proposed towers required the demolition last year of the 1949 William J. Heiser-designed press building just to the west of the landmark. Finally, for some recent indoor shots, see chuck 91214’s Flickr set here. 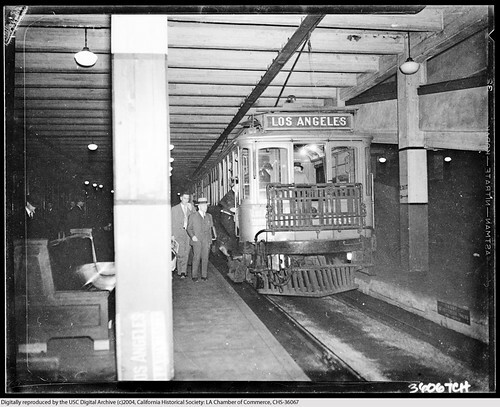 On June 5, 1923, in the same election where they approved the bond and location of a brand new City Hall for Los Angeles, L.A. voters approved, by a margin of 11,645 to 3,373, plans for the city’s first subway with its central station under – wait for it – Pershing Square. No lie. 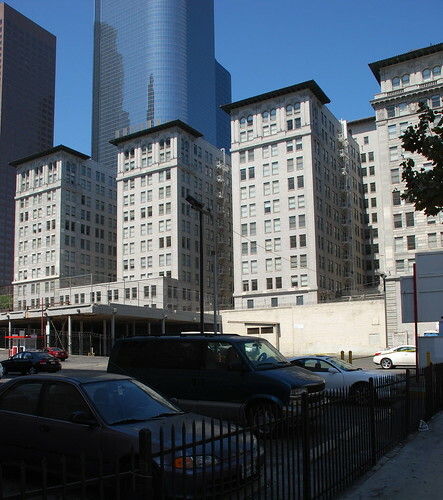 The Los Angeles Times wrote the vote could be seen “as a result of traffic congestion in the narrow downtown streets.” Of course, the Pacific Electric never did build its central station – or any other station, for that matter – under Pershing Square. It’d take another seventy years before the most useless public park in America would get its own subway stop. A year and a half later, though, on January 7, 1925, the Subway Terminal Corporation announced plans to build a $4 million, twelve-story (then the height limit) subway terminal a block away from the park, taking up part of the land then occupied by the P.E.’s Hill Street Station dating from 1908 (pictured here next to the old Masonic Hall). The Corporation, which would build and own the structure, was headed by J.F. Sartori, president of the Security Trust and Savings Bank. 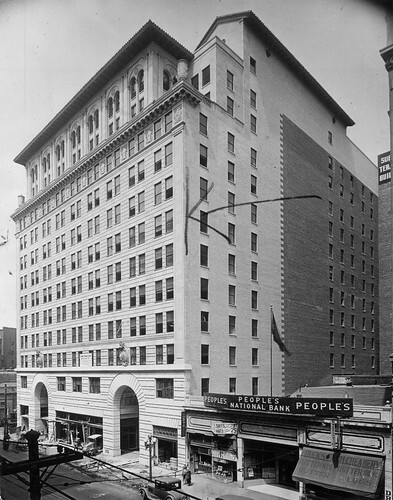 The Board of Directors included Eli P. Clark (who, besides having planned a subway from the site years before, had his hotel across the street), F.W. Kellogg, Harry Chandler, and D.W. Pontius, vice president and general manager of the Pacific Electric Railway. 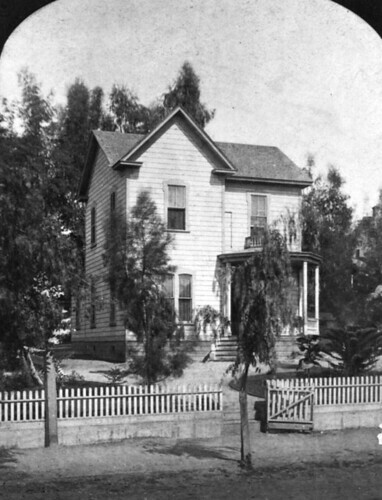 This is the home of Judge Robert M. Widney in the 1880s. This would become the site of the Subway Terminal Building forty years later. Apt, too, because Widney built L.A.'s first streetcar line. 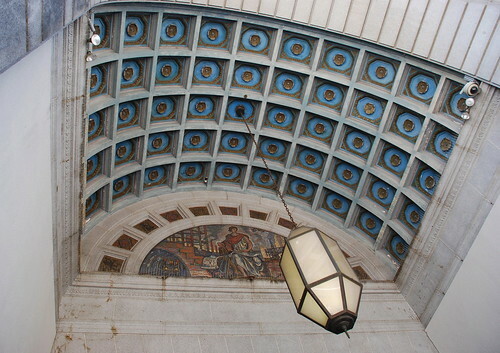 Photo from the L.A. Public Library. The location and makeup of the central station/terminal may’ve changed, but the plans to build a tunnel for the Red Cars out to where Beverly and Glendale Boulevards meet remained more or less the same. 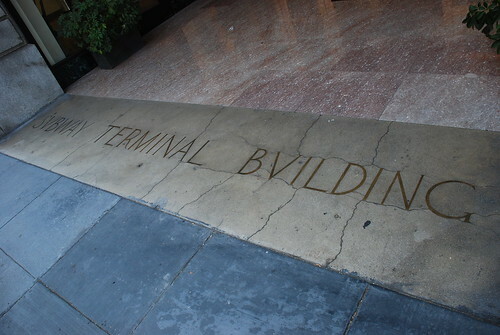 The Corporation hired architects Leonard Schultze and S. Fullerton Weaver to design the terminal. 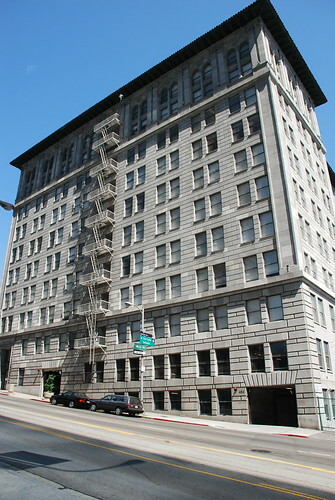 The team had completed the Biltmore around the corner a few years earlier and were then working on the Jonathan Club at Fifth and Figueroa. Outside of L.A., their credits include the Breakers Hotel in Palm Beach and the Waldorf-Astoria in Manhattan. Excavation work on the building began on May 3, 1925. The digging would be wrapped up by August 23, and workers celebrated completion of the steel framework on October 24. 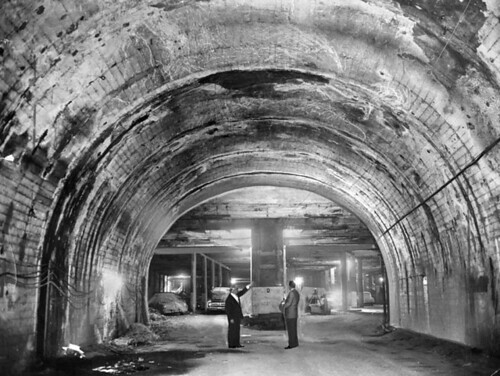 Construction on the tunnel itself had been underway for a full year by the time excavation for the terminal building had begun. Starting in early May 1924, crews removed dirt for about six weeks, then began drilling the tunnel’s core on June 13. 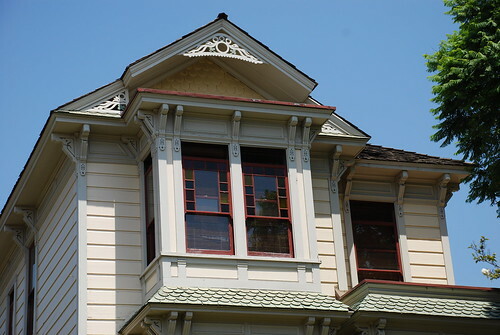 The general contractors were the Twohy Brothers of Portland. With around 650 men on the project, digging around the clock on three shifts of 210 men each, the bore was completed on April 16, 1925. Once the concrete lining had been set, work began on installing tracks and wires. 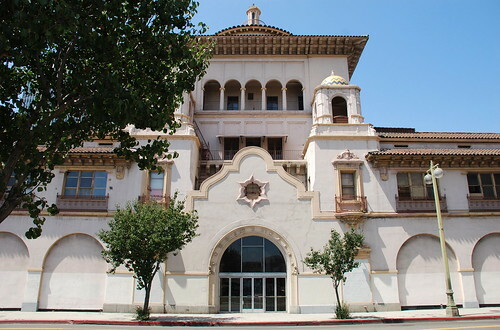 The Subway Terminal Building wasn’t finished when the Hollywood Subway, Los Angeles’s first, ran on November 30, 1925. 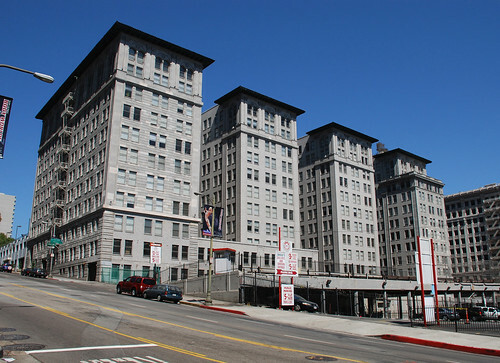 The marble-floored station took up the first two floors, but there were still to be finished the 900 offices with 1,100 rooms on the remaining floors. When completed, the building would be the highest commercial office structure west of the Mississippi River. As part of the opening celebration, D.W. Pontius’s niece, Mrs F.E. Bilhardt, kicked things off nicely by christening car No. 741 with (“it was said”) ginger ale, being all Prohibition-friendly. Regular service began the next day, December 1, at 5:00 a.m. with sixty-seven trains running daily to Glendale and thirty-two to Burbank. 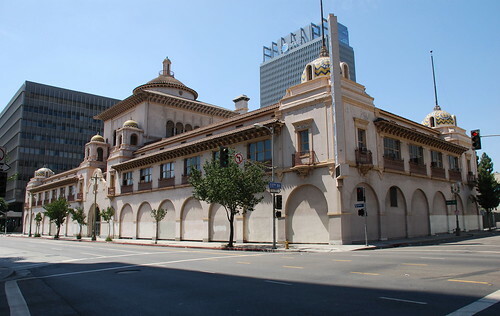 At that time, it was reported the Pacific Electric Railway Company and the Subway Terminal Corporation spent $9.25 million on both the tunnel and the terminal building. The subway station could accommodate five tracks and thirty cars. In addition to the Glendale-Burbank route, the subway would go on to serve the Hollywood, Santa Monica-Venice, and San Fernando Valley lines, too. It was figured the tunnel – at 4,325 feet, about four fifths of a mile – shaved off fifteen minutes of travel time. Along with the shorter time came a lower fare – at least temporarily – of three cents round-trip, two cents one-way. The Subway Terminal Building’s traffic reached a peak during World War II with 884 trains, made up of 1,184 cars, rolling in and out of the subway each day. The Pacific Electric’s thirty-year subway service history reached the end of the line on June 19, 1955, at 1:40 a.m. the same way it began – with the Glendale-Burbank line. The Pacific Railway Society had a final, final run later that morning, and the Southern California division of the Electric Railroaders Association had a final, final, final trip that afternoon. After that, the busses took over. Metropolitan Coach Lines, which had assumed the P.E.’s passenger operations in 1953, promptly used the tunnel for storing old streetcars. The building was eventually taken over by the Federal Government, first for the Social Security Administration, then for the Veterans Administration. After the old Red Cars in storage were sent off to the scrapyard and to Argentina for re-use, the Belmont Tunnel was prepped as a fall-out shelter and then for storing autos confiscated in drug busts. Declaring it unsafe, the city filled in the tunnel from Flower to Figueroa at the end of 1967. David Hart bought the Subway Terminal Building with a silent partner in May 1979 for $5.25 million. 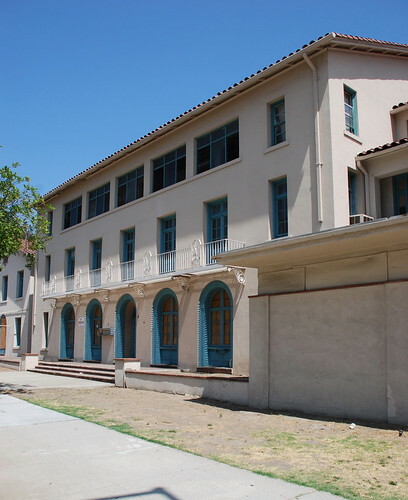 Hart hired ubiquitous L.A. architect Brenda Levin (the Pellissier Building, the Oviatt Building, the Eastern Columbia Building, and the Fine Arts Building) to handle a $3 million restoration of the building. Hart also commissioned Jeff Greene of EverGreene Painting Studios Inc. in New York to create the 560-foot-long, 28-feet-high trompe l'oeil on the building for $75,000 (so those windows you see up top on most of the Fourth Street side are phony). By this time, there remained but one block of tunnel on the terminal side, from Olive to Grand. 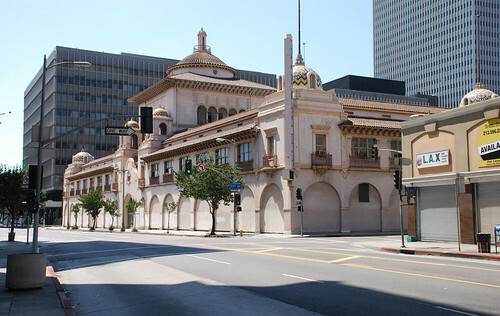 Such was the renewed interest in the old building, Mayor Tom Bradley declared March 31, 1986, “Subway Terminal Building Renaissance Day.” Remember, the sixty-year-old terminal had recently become a much more prominent landmark downtown – four buildings to the terminal’s south, including the Philharmonic Auditorium, had recently been razed. All this hope and goodwill aside, the building was in foreclosure a decade later. Forest City Enterprises bought the Subway Terminal Building in 2003 and, since the end of 2005, it’s been the apartment building Metro 417, providing “277 boutique-style rental residences.” Of course, I wasn’t allowed to take any pictures inside (a guard there warned he’d have to strangle me… he was around 84% kidding) so I certainly didn’t get down into the basement to see what remains of the old subway. However, the good folks at Esotouric got there, and they’ve got the pictures to prove it. 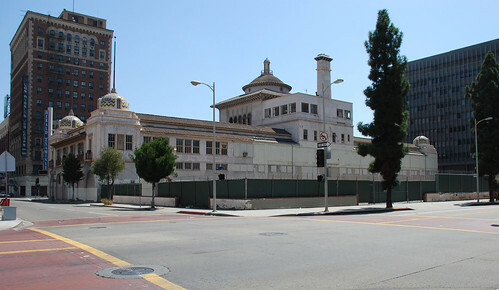 To boot, there are several sites dedicated to what happened to the northern end of the Belmont Tunnel (half of a Los Angeles Historic-Cultural Monument in its own right, but that’s more than 600 posts away). This Was Pacific Electric dir. Thom Eberhardt 2005 Sky City Productions, Inc. 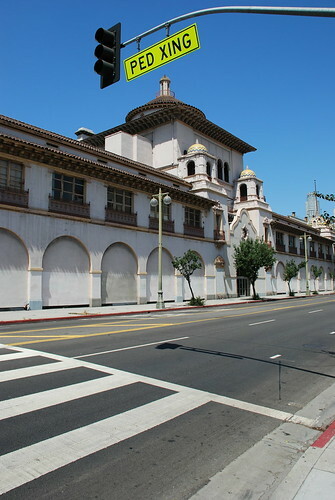 Along with Los Angeles Historic-Cultural Monument No. 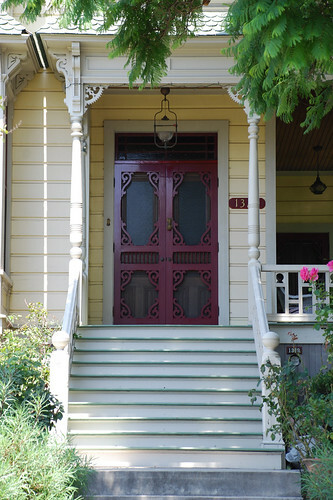 109, the Irey House next door, this Victorian home was moved from its original location on Court Street to its present site on March 22, 1978. 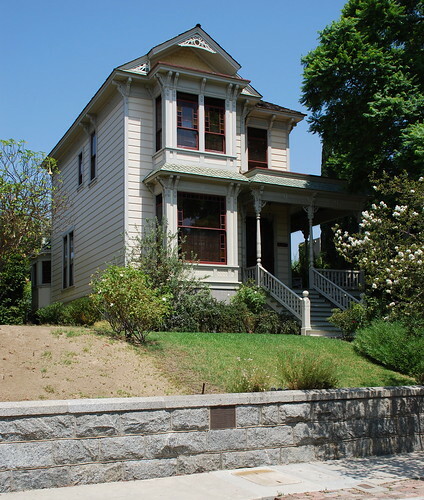 The home, at 1145 Court, was part of the Beaudry Brothers’ Park Tract development. 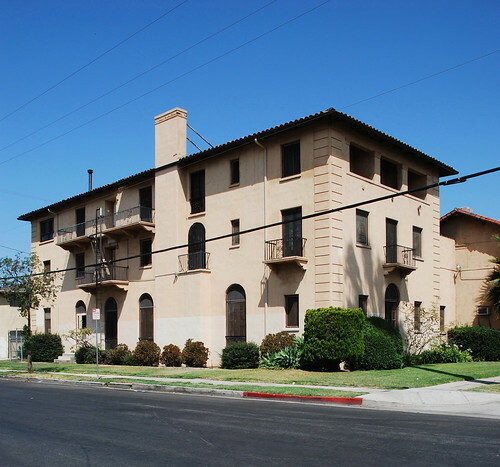 Gebhard and Winter, in Los Angeles: An Architectural Guide, write the building’s style is late Eastlake. 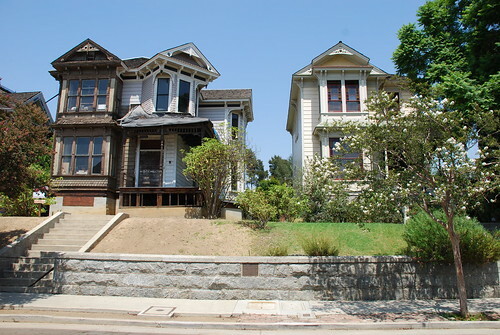 If the 1887 date is correct, the home was built at the tail-end of L.A.’s first big real estate boom. 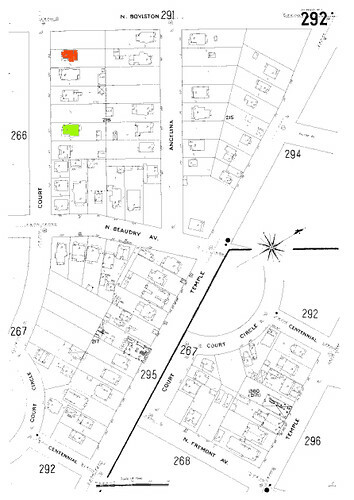 Here’s a Sanborn map from 1906 that shows not only this landmark of the future (in red) but also the Irey House (at 1123 Court, in green). Now, this isn’t the first 1321 Carroll Avenue home. 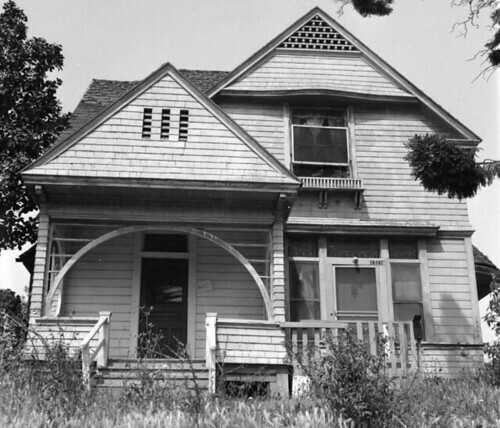 The site's original house, pictured above, was torn down in 1970. I grabbed the shot from the L.A. Public Library’s Photo Collection. It was taken by Peter Antheil. Thanks, Peter. 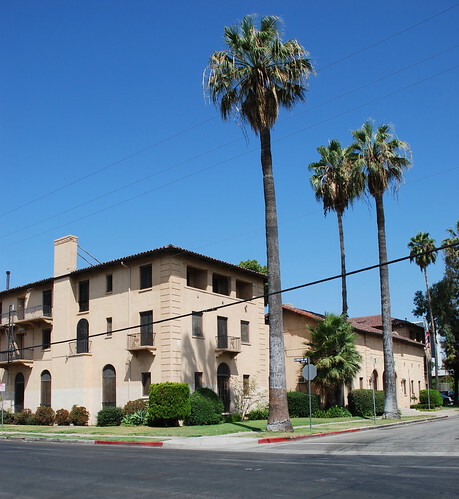 In 1978, LAACO, Inc., and William and Marilyn Soukesian donated the pair of homes to the Carroll Avenue Restoration Foundation (while the Foundation had been formed three years prior, this was its first major project). The city landmarks, both well-worn and graffitied up, were moved the half-mile to the Carroll Avenue vacant land, sold by Arthur and Dixie White. It was this home that got the old address. 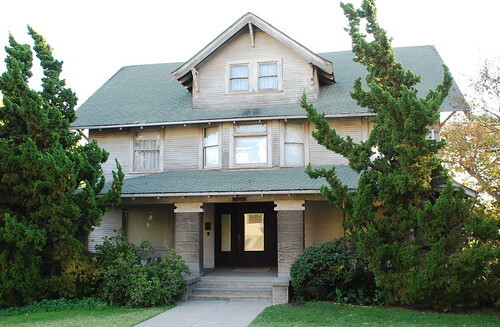 Cecil R. Dover and Edward S. Postnikoff were the house’s first owners in its new location. Again, from the L.A. Public Library archive – god bless ‘em – here’s a photo of moving day, 3/22/78. HCMs Nos 109 and 176. 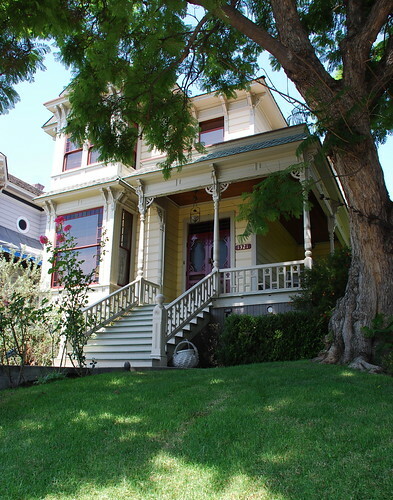 Like its next-door neighbor, 1321 Carroll Avenue is for sale. 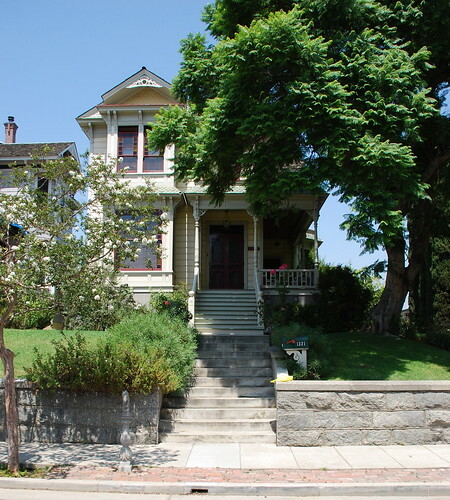 But while the Irey House – on the market at least as long as I’ve been blogging – now has a price that’s “to be determined”, today’s landmark will run you $1,576,000. Here’s the link to a virtual tour, with pictures of the interior, if you’re interested. (I was this close to posing as a potential buyer to get shots of the inside, but even being disingenuous takes too much effort.) 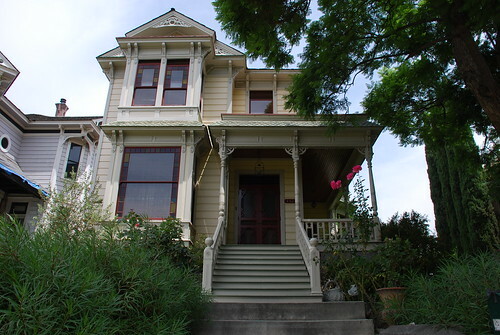 The realtor says the home was built in 1885. It’s got three bedrooms and two and a half bathrooms. 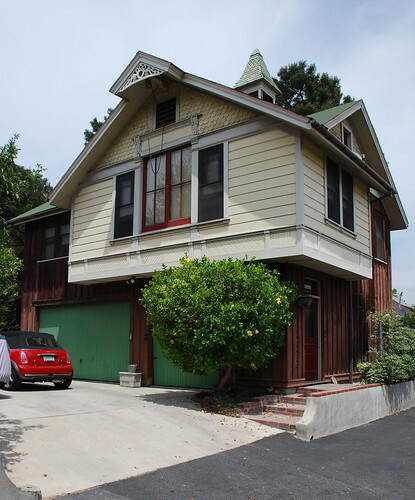 The old carriage house has been converted into a one-bedroom apartment with a three-car garage underneath. Here’s a picture of the (non-landmarked) carriage house. 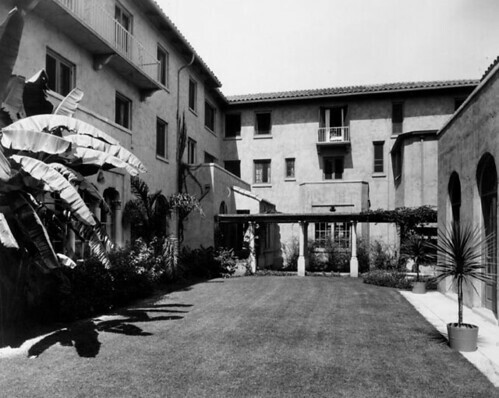 While our landmark building has been around since 1926, the Hollywood Studio Club organization itself pre-dates the structure by a full decade. 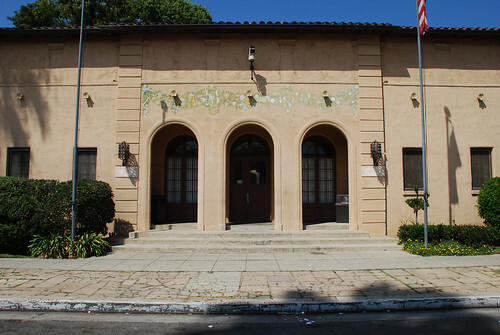 Mrs Eleanor Jones, a librarian at the Hollywood Branch Library, formed the society in 1916 as a way to give young ladies looking to make a break in the movie business a place to get together and read plays. Originally, meetings were held in the library’s basement. 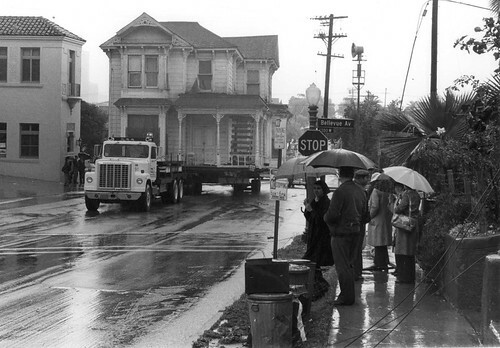 Shortly after, the club relocated to a separate hall and then into a house at 6129 Carlos Avenue, which had living space for about twenty women. The National Board of the Y.W.C.A. took over the club in 1918. 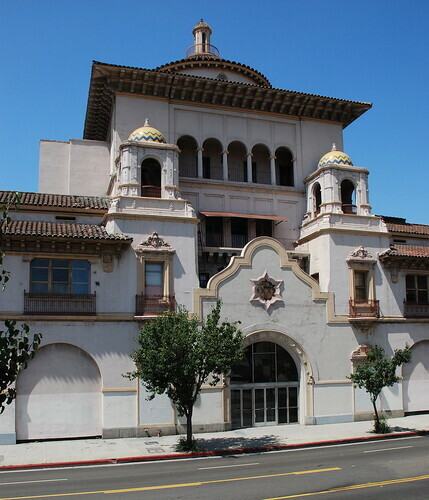 Beginning in 1923, after it was decided not to build a new facility at the Carlos Avenue address, Cecil B. DeMille’s wife, actress Constance Adams, led a huge fund-raising campaign for a brand new club at the corner of Lodi and Lexington in Hollywood. Both studios and individuals rushed to donate to the cause. It seems everybody involved in the industry ponied up some dough, from Famous Players-Lasky, Metro-Goldwyn, Carl Laemmle, and Warner Bros to Doug Fairbanks, Mary Pickford (who was very active in the campaign), Harold Lloyd, Howard Hughes, Gloria Swanson, Jackie Coogan, and Norma Talmadge, who kicked in $5,000. (If you contributed $1,000 or more you’d get your name on one of the rooms’ doors.) There were also donations from Marion Davies, Mrs Arthur Heineman (chairman of the executive committee), Will Hayes, and the Doheny family. And don’t forget about the money from the Y.W.C.A., of course. They added the $94,435 they made from selling the Carlos Avenue place, which they had bought a few years earlier for just $23,000. Now, I don’t which of the women in the picture below is Mrs DeMille, but I do know every one looks more formidable than the next. Each could easily intimidate me into handing over a check or two. 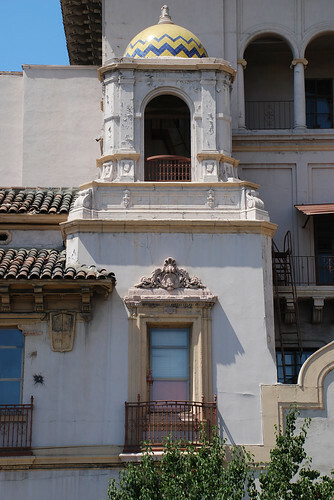 The job of designing the new club fell to Julia Morgan (1872 – 1957), a woman, fittingly enough. 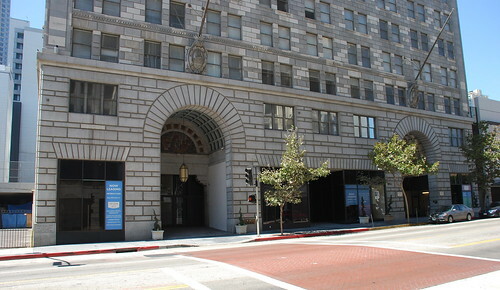 Although she’s got about 800 buildings to her credit, Morgan, a San Francisco-born architect, is maybe best known today for her work on William Randolph Hearst’s San Simeon castle (and, locally, his Herald-Examiner headquarters downtown, HCM No. 178). 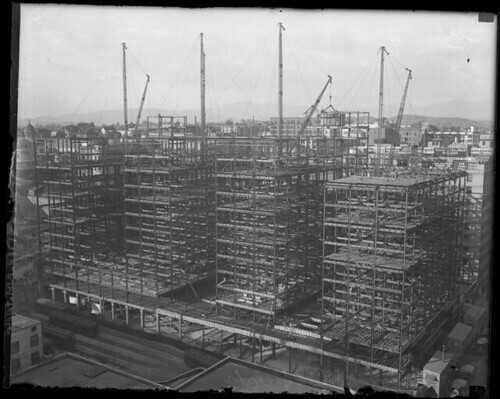 As California’s first licensed female architect, Morgan was no stranger to designing Y.W.C.A.s, her first being constructed in Oakland in the early teens. 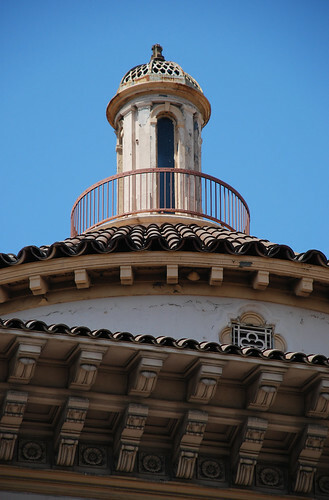 Besides the Hollywood landmark, her local Y.W.C.A.s were in Long Beach, San Pedro (HCM 186), Riverside, and Pasadena. 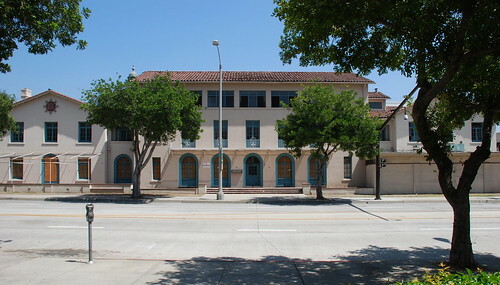 Quick aside: below are three pictures of Morgan’s Pasadena branch, built in 1921. Sadly, it’s all boarded up with broken windows. I asked a homeless guy there, "Who owns the building?" and he told me, “Alex.” As it sits opposite City Hall, I’d expect someone – probably not Alex – could figure out some sort of adaptive re-use of the eighty-seven-year-old building. 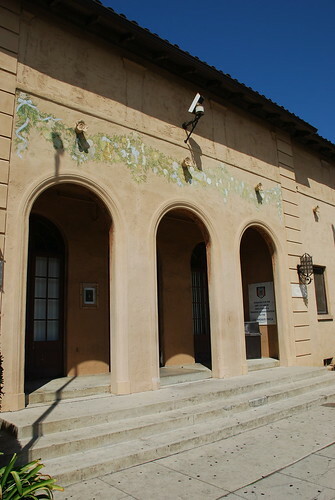 Julia Morgan's 1921 Pasadena Y.W.C.A. 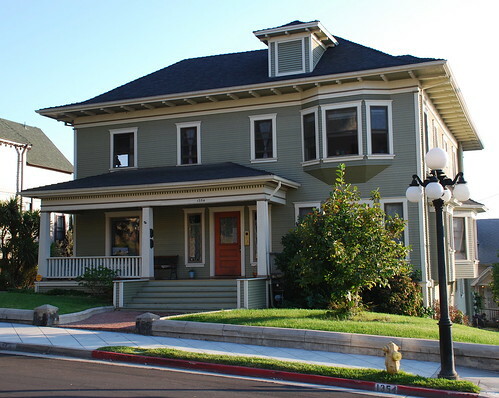 Morgan designed the three-story Studio Club in a Mediterranean style. It’s got a central section with wings that connect on either side, not unlike the Pasadena building. All told, the building cost nearly $230,000, an awful lot of money in those days. 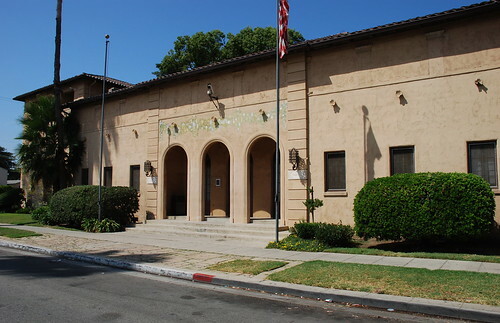 Friends of the Hollywood Studio Club and the National Y.W.C.A. 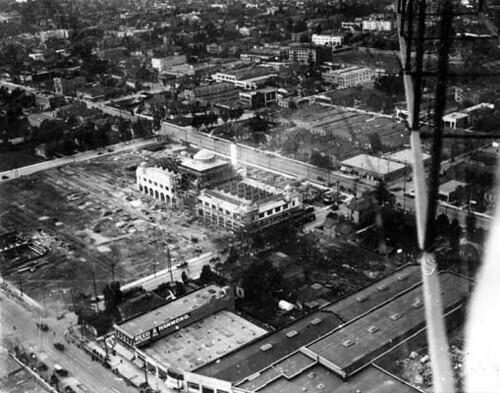 broke ground on the building on June 15, 1925. Mrs DeMille and May Parker, the club’s president, started the steam shovel, and the Hollywood High School band played a few numbers. Also there was Zasu Pitts, a former resident at the Carlos Avenue house. 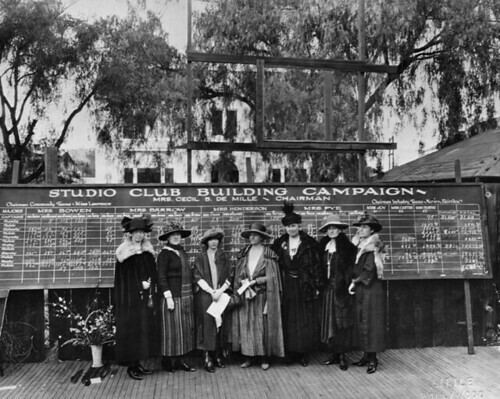 The Studio Club originally housed eighty-eight women, women who had come from all over the country to work in the movie business, from script girls to actresses. For no more than $15 per week, a woman’s room and board consisted of a single or double room and two meals a day. They also had use of the club’s sundeck, rehearsal hall, and small auditorium. 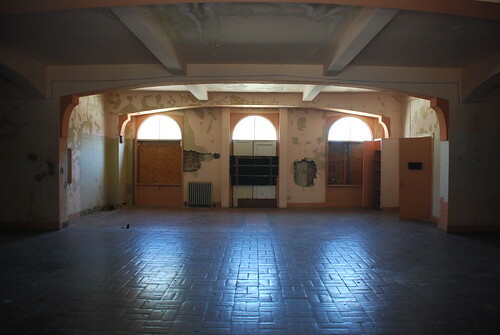 The club would hold classes, put on plays and shows, and host dances and dinners. The courtyard. This and the black and white shot above are from the L.A. Public Library. Just get a load of this roll call of some of the women who called the Studio Club home: Marilyn Monroe, Gale Storm, Donna Reed, Kim Novak, Rita Moreno, Evelyn Keyes, Linda Darnell, Barbara Hale, Ayn Rand, Donna Douglas, Ann B. Davis, Barbara Eden, JoAnn Worley, Susan St James, and Sally Struthers. All told, in its fifty-year history, the club had been home to about 10,000 young women. By 1971, the club had fallen from grace and was a regular hotel, with transient women making up a big part of the Y’s clientele. Losing money as it was, the straw that broke the camel’s back was when new fire laws were passed in 1970 demanding the club perform $60,000 worth of renovations to bring the old building up to code. The Studio Club closed in February 1975. The Y.W.C.A. kept some business offices there, but even they were out by 1977. In May of that year, the city declared the old club an L.A. landmark. A month later, the club became the new (co-ed) home Jobs Corps, which it remains today (at least for now). The Y.W.C.A. 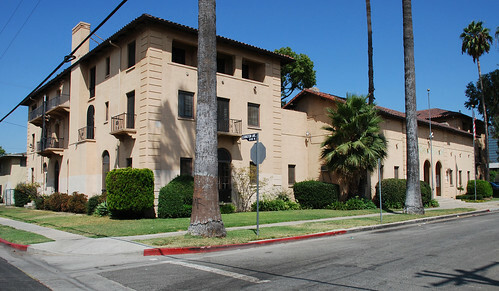 Hollywood Studio Club was listed on the National Register of Historic Places in 1979. Final note: if you’re in the neighborhood, pop in the lobby. Besides being a great space in its own right, it contains a lot a great Club memorabilia, stuff about Julia Morgan, and a scale model of the building. Of course, photography inside the building is verboten (why? ), and, at least when I was there, the staff was unwelcoming (why? ).